“I am a retired gynaecologist and I worked closely with GRACE founder Simon Butler-Manuel. 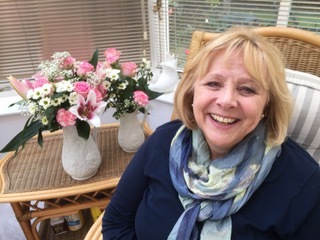 When my wife developed her gynaecological cancer, my friends and colleagues at East Surrey and the Royal Surrey Hospitals cared for us throughout her investigations and treatment. One morning in early October 2016, Madeleine and I were sat at the breakfast table and she told me that she needed to ask for my professional advice. She said that she had some post-menopausal bleeding. I knew it was best to get it checked out so I arranged for her to see Karen Jermy at East Surrey Hospital. Of course, most women who have post-menopausal bleeding don’t have cancer and those that do are usually treated and cured by having a hysterectomy. So we were, at this point, optimistic. After some tests, we were told that she had endometrial cancer and would need surgery, which Simon was to perform using the DaVinci robot. However, I started to get concerned when she was in surgery for four and a half hours – I expected it to take an hour or so. Eventually Simon came out of the operating theatre and told me that the cancer has spread. At this point I knew it was incurable. From my point of view this was the hardest time. I knew she was going to die - not there and then, but that she would face further treatment without a realistic prospect of cure. Although I had told many of my own patients similar bad news, I had never expected to break such sad news to my wife. The morning after her hysterectomy Dr Alex Stewart offered Madeleine chemotherapy. Madeleine asked how long she would live, both with and without the chemo. She was told 8 months without chemo and a year to 18 months with. Her response was to say “well it is what it is, let’s get on with it”. She made the decision to have chemotherapy so that she might have a bit more time to do the things she loved. After retiring from her first career as a family lawyer Madeleine studied calligraphy and fine art, obtaining degrees from universities in England and Finland. When people asked her about a bucket list and she would just say that she didn’t have one because she had done everything that she wanted to do. Just not as much or for as long as she wanted to. We had done a lot of travelling and she loved going to galleries, theatres and museums. Madeleine had a thirst for knowledge and a very special artistic creativity; she just wanted to carry on doing everything she was already doing. We did take a trip to Florence and Urbeno because she said that there were things that she wanted to see. We also spent some time in Austria, where she loved to be in the mountains and we had a last visit to Northumberland, which is where her family are from, for her 66th birthday. Whilst we were away in Northumberland she had some pain in her abdomen, which she didn’t tell me about until we got home. Investigations showed that her cancer had returned, as we knew it would. Madeleine started radiotherapy, but her cancer continued to grow and spread. Madeleine died peacefully at home in October last year. Madeleine loved life and felt incredibly lucky to be born in a time with free education and the opportunity to pursue a fulfilling career, in a time of peace in Europe. We were married for 46 years and she had incredibly good health until her last year of life. Even throughout her treatment she would say, “I don’t feel ill”. Apart from a few days after each chemotherapy session and the last 3 weeks of her treatment she enjoyed good quality life. She never complained or asked, ‘Why did this happen to me?’ or ‘What if I had done something differently’, she just took it all in her stride and got on with enjoying being alive.